Browser Champion is yet another adware application that has been bothering quite a few users lately. Within the official website, publishers state that their application will protect their browser from entering any potentially malicious websites. Ironically, Browser Champion will not only fail to protect your browser but it will most likely expose you to potentially malicious websites that it will not block. There is no rational reason this application should be kept on your system. Removal of Browser Champion is the only way to go. Otherwise, your system will be at great risk. Removal guide and further information regarding this nasty internet-based infection are provided within this report. 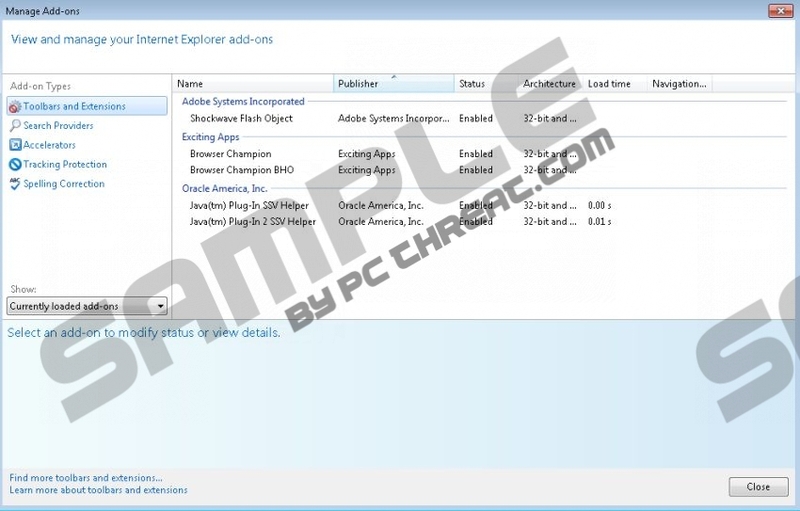 Technically Browser Champion will do what so many other adware applications do. First it will install browser extensions to such web browsing applications like Mozilla Firefox and Internet Explorer. Changing your default browser to Google Chrome does not mean that the infection is not operating on your system. Removal is needed as soon as possible. Furthermore, it will start displaying numerous worthless ads while you browse the web. Ads will appear on a random website and at random times. Often you could be presented with ads that contain redirect links to websites that are corrupted. For instance, you could land on a website that was created by malware distributors in order to infect users with their internet-based infections. Often websites like that contain an arbitrary code execution exploit. This exploit allows malware distributors infect your system in a timely manner. Your system will probably get infected as soon as you land on a website like that. Removal of Browser Champion will significantly lower the risk of other infections infiltrating your system. Furthermore, it was revealed that Browser Champion is capable of editing the Windows hosts file. The hosts file can be used in a few different ways. For example, if you edit the hosts file in a certain way you can block various adverts from various unwanted servers and that is obviously quite helpful. The other way that this particular file could be used is to enter certain address lines that would be promoted while you browse the web. In this case, Browser Champion enters an IP address of a certain remote adware server that may be used to update the application or even worse – could be used by leftovers of this program to restore it after an improper removal. It is crucial to remove every bit of Browser Champion as it might be capable of restoring itself as mentioned earlier. Furthermore, it is paramount to realize that adware applications could be just as serious as Trojans or Keyloggers. Technically adware applications are not as aggressive as Trojans or their counterparts but can promote quite detrimental activities. In order to remove Browser Champion entirely, you should follow the guide that we provide closely. If you wish to be exactly sure of your system being entirely clean, you should use a professional antimalware tool. Navigate the mouse cursor to the bottom right corner of the desktop. Locate Browser Champion and remove it. Select and uninstall Browser Champion. Remove Browser Champion from the program list. Tap the Windows button and select Computer. Now select Local Disk (C: ). Open System32 folder and then the drivers folder. Now click etc and then open the hosts file with Notepad. Remove everything that comes after # 127.0.0.1 localhost and # ::1 localhost. Quick & tested solution for Browser Champion removal. Thanks a lot! Nice explanation.